Yesterday, gold prices fell for the second straight day, while silver prices also fell yesterday for the first time since April 1st (no joking…) will these price cuts will continue? The April rally of precious metals came to a halt in the last couple of days, mainly for gold. As of April 12th, Silver price has risen by 6.19%, while gold price increased by 1.73%. The gold to silver ratio: As of yesterday, April 12th the ratio between gold and silver prices reached to 36.28. Notice that in the chart below of the daily percent change correlations among silver, gold prices and YEN/USD. 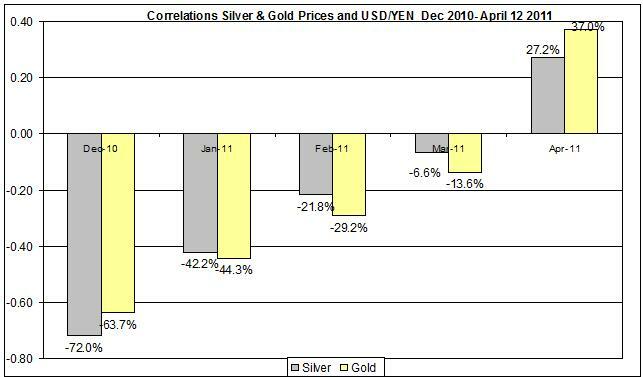 It shows that there has been an upward trend in since December 2010 in the correlation between USD/YEN and gold and silver prices. Currently, the April correlations are at 0.37 for gold and 0.272 for silver. This might have something to do with the tsunami attack on Japan. The April correlations however should be marked with an asterisk, because there were only 8 business days during April, so far, and thus the significance of these figures isn’t strong. As the month will progress it will be interesting to check if this relation between USD/YEN and gold and silver prices will remain high. There isn’t much progress in the war in Libya between the rebels and Gaddafi. See here for a more detailed update on Libya and its affect on commodities’ markets. 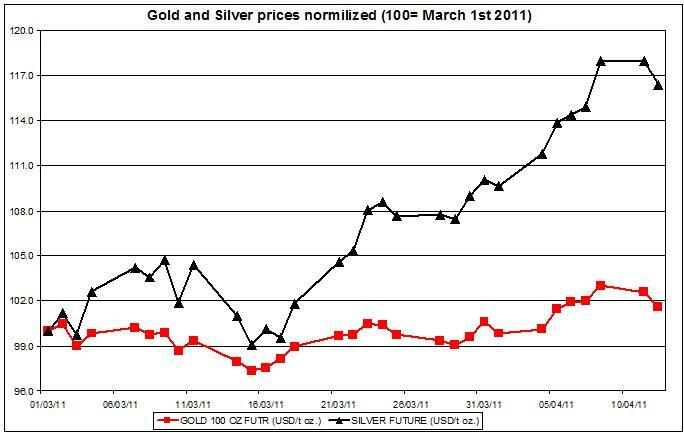 The current gold price, short term futures (May 2011 delivery) is traded at 1,458.5 USD / t oz. a 4.9$ increase or 0.34%, as of 12.06*. Current silver price, short term futures is at 40.285 USD / t oz – a 0.219 increase or 0.55%, as of 12.07*. The current ratio of gold to silver prices is at 36.2. I speculate that gold prices will remained with little change and no clear trend as the week will progress. The same goes for silver prices. 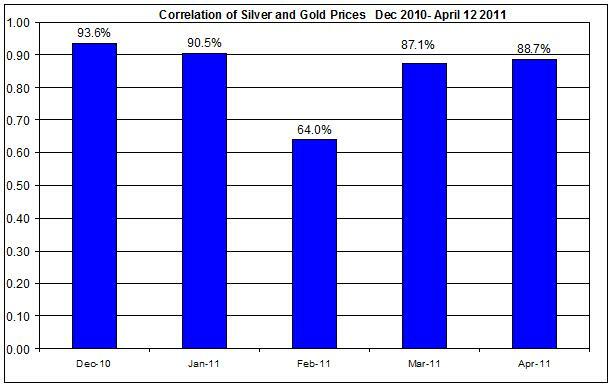 Gold prices outlook for April 2011 – what’s next for gold?